Chaos Comics first and only real event story arc. 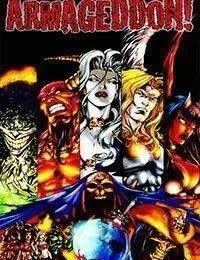 Gathering together all the major players from the Chaos Comics universe this 4 issue arc was released in the last 3 months of 1999 with the finale release January 1st 2000. The story-lines of all the major characters come together into one cataclysmic event with their individual comics, published along-side these issues, intertwining into the story making for a total of 14 issues that interconnect with the Armageddon series.